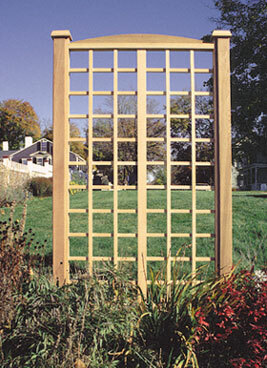 While it can be mounted to the side of a house, this trellis is perfectly suited as a stand-alone support for climbers within the garden and offers an excellent solution for creating a "green screen." Strong 4" x 4" posts, supplied with aluminum pipes for installation, enable a secure footing in the ground. Multiple units can be combined, with a common post in between, to create longer lengths of treillage. See line drawing below. 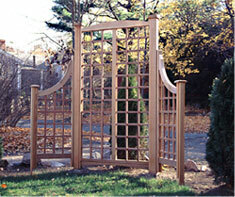 Shown below is the Garden Trellis with extenions, applied at a slight angle.